Mr. Izu and his companion Malco came to dinner last night. I spent the whole day preparing. Well cooking. I wanted to make something special. Something Hawaiian. Something mostly soft and palatable that would not offend, including everyone human on our farm. When I cook, it’s part planning and part inspiration. I had decided on fish cakes and knew that purple Okinawan yams would be on the menu. Plus green beans. The fish cakes remained fish cakes. The yams became part of a ‘potato’ salad. The beans were made peas, instead. Although for the past forty years the temperature on Magic Mountain Farm has always been between 47 and 84 degrees Fahrenheit, that is too cold for breadfruit, a native plant that sustained an estimated population of 300,000 people who lived on this island before Captain Cook ‘discovered’ it, in the bay just below where we live. It grows best at around 800 feet, and continues up the slopes of our volcano to about 1700 feet, where it peters out because of the lower temperatures. We cannot buy breadfruit at the store. We are gifted by friends, or we do trades. Sometimes we get it at local farmer’s markets, or ask at the Painted Church to take some from their grounds. However we get it, we treasure it. Especially because my husband cannot eat potatoes, which they taste like. 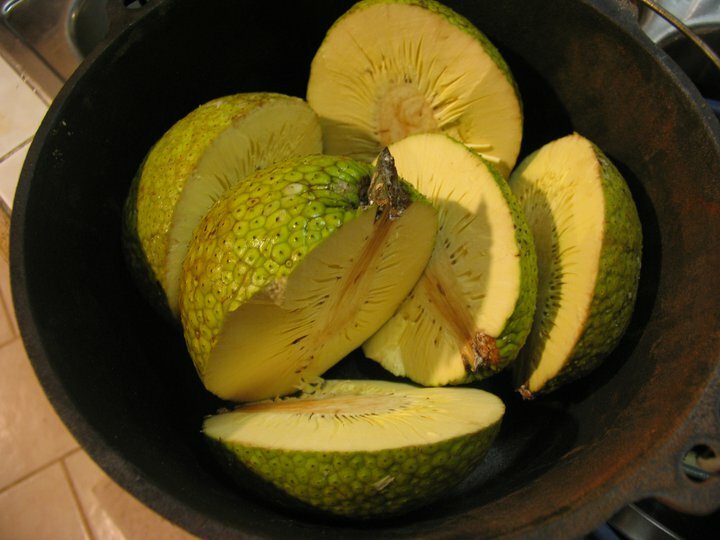 When I first learned about breadfruit I was afraid. In the same way I was afraid of cheese or carrot cake as a child. Big hunks of cheddar or cooked veggies in a cake? No thank you. Bread-flavored fruit? Please. Spare me. If one does not know how to prepare breadfruit, it is pretty disappointing. Ripe and raw it is the consistency and flavor of a bland pudding. Fresh and green it is very firm, requiring strength and a sharp knife to cut. If steamed, it can be very mealy and dry. Which, come to think of it, is how a potato is, too. But learn how to prepare it and breadfruit, like potatoes, is amazing. Once steamed, breadfruit remains firm. It can be cut up and fried in coconut oil. Add onions and peas and it becomes hash. The hash tastes even better with thinly sliced pieces of leftover bbq’d meat. Follow a recipe for stuffing at Thanksgiving. Replace bread with cubed, steamed breadfruit. The result tastes like a cross between really good mashed potatoes and stuffing. If the breadfruit is soft and over ripe, locals like to eat it by the spoonful on a ti leaf with raw ahi (tuna). I am terrified of raw fish in general and dislike the sweet, pudding-like texture of the ripe breadfruit, so this concoction has not passed my lips. Instead I save the overripe fruit and beat it into pancake and waffle batter. The result is absolutely delicious. 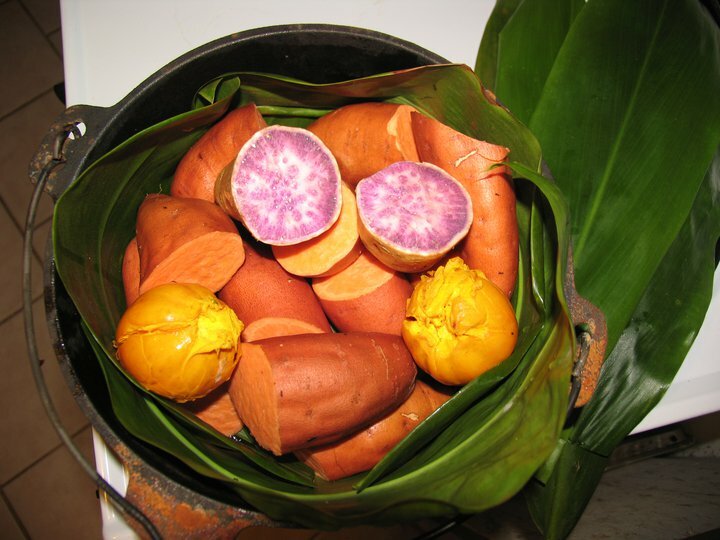 Purple Okinawan Yams, Egg Fruit, ‘Regular’ Yams, & Ti Leaves. Last night, I served up breadfruit in two dishes, fishcakes and the ‘potato’ salad. The fishcakes were fried in coconut oil and tasted, well, to be completely objective, spectacular. The salad, which incorporated the purple yams and breadfruit, was to die for. I had three helpings of each, and would have gone back for a fourth, if there was a way to pack any more in. We had told Mr. Izu, who is past 90, who still lives on the farm where he was born, not to bring anything. So he brought my husband a pen he made from avocado wood, and also a paper holder, an oven spatula, and a heart with the words ‘Kiss the Cook’ inscribed. His companion Malco brought two jars of homemade jaboticabo jam. And we all sat round a table on a deck, overlooking the ocean while the sun set and talked story and ate and visited to our hearts’ and stomachs’ content –our woofers* Jay and Laura; our dear friends and tenants Juli and the Dolphin; Mr. Izu, Malco, my husband, and Dolphin’s aide Jennifer; and Jennifer’s dog, Bootsie. And when we were sipping on coffee and spooning up our chia seed pudding I asked Mr. Izu and Malco, if we could do this all over again, next month. 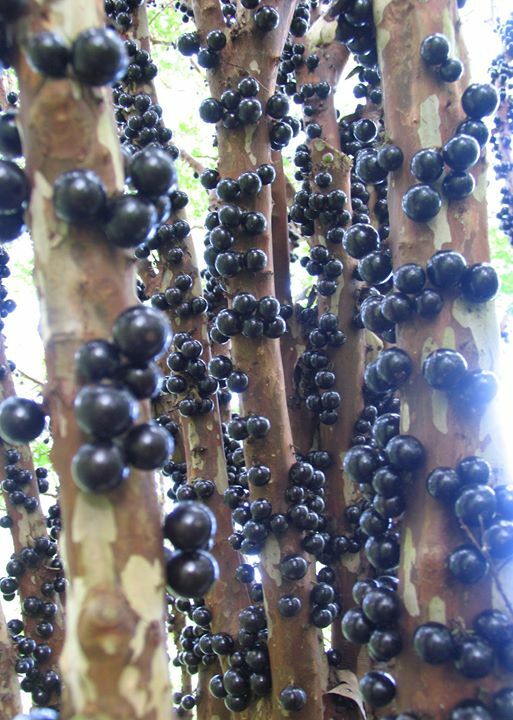 A Jaboticabo tree on our farm. Excellent timing. We have been talking about everyone and everything at the farm. The electricity is off here, as the place is being upgraded for practically and safety. We are giving away as much as possible to all our few friends. The photo is beautiful and amazing. My astonishment at the fruit of the beautiful tree and the story of a magical (to us)meal has a ripped effect. Now we will begin to dream about more details and people .How beautiful. Amazing life. Love to all. I hope that our comments have been going through. Lol. Lola just laughed at my squinting one finger typing. She has asked me to tell you that we will get new glasses before we come so that we can see the big picture. Lol. Love to all. Teach me oh swami oh mightie wise one.